How To Cut, Light & Store Cigars - A Complete Guide. To get the most from your cigar smoking it is important to master the art of preparing your cigars. 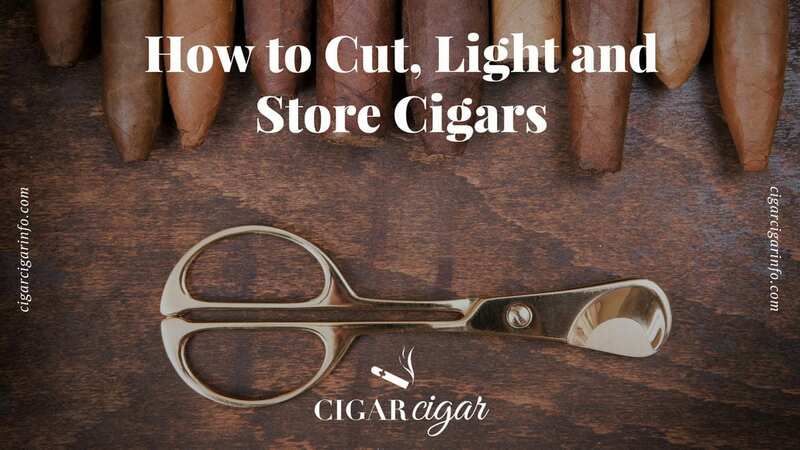 The following post explores how to cut a cigar, light a cigar and store your cigars properly. Now that you’ve got an idea about the types of cigars, let’s move onto how to cut them. A very crucial step. If you cut your cigar incorrectly you stand to ruin the whole thing. There is nothing worse than a tear in the wrapper that can unravel while you are smoking. This is why it’s so important to cut it correctly. Luckily there are many tools out there for exactly this. In our opinion the best types of cigar cutters are double blade guillotine or v-cut cutters. Ideally, you want to cut the cigar in one smooth motion.
. In general, the guillotine cutters can be used for most. They provide a very fast, sharp, clean cut are many cigar aficionados will use them. Second to the guillotine style cutters are v-cut cutters. These create a wedge in the cap which is where you inhale the smoke through. A little tricky to do in the beginning but after some practise you may like this method. Some cigar smokers prefer the V cut as it slightly lessens the bitter taste of some cigars. Regardless of the cutter you use the most important thing is that you don’t tear the wrapper or have it unravel. If you cut the cigar wrong this is most likely to happen and that will be the end of your cigar. Have a read about our 12 best cigar cutters and decide on one for yourself. Now that you’ve cut your cigar it’s time to light it. The most popular, easiest and best way to light a cigar is with a butane lighter. We have both comprehensive lessons on how to light a cigar as well as reviewed our best cigar lighter. Cigars should never be lit with matches, candles, bic lighters or anything that has not been specifically designed for cigars. The reason- chemicals, residues and fuel will transfer from the flame and onto your cigar. This is going to alter the taste, aroma and flavor which is going to completely change your smoking experience. Now you will need to prime your cigar. Do not place a cigar directly in a flame, you need to keep about a two fingers gap distance between the cigar tip and light. Once you have lit it, after a few seconds rub your thumb or fingers over it, this will ensure a clean burn. Once you notice that is glowing orange and is lit you can start to take puffs. You may need to take 5-6 puffs before the cigar is well lit and producing enough smoke. Do not inhale the smoke. The idea is to have a drag every 2-4minutes but again that will change with the cigar and your mood/style. Puff on the cigar, and swirl the smoke around in your mouth enjoying the flavors before blowing the smoke out. Enjoy your cigar and first smoking experience! An important part to cigar smoking is to store them correctly. Cigars need to be kept in a humidor in which the climate is controlled. If the climate is dry the cigars will dry out, if theres too much moisture the cigars will absorb it. There are many different types of humidors available, have a look at our comprehensive Best Cigar Humidor review. An overly moist cigar will be extremely hard to light and burn. The smoke will be rough and your experience most likely bad. With dry cigars the smoke is going to be aggressive and will be too strong to enjoy the flavors. A humidor controls the environment for your cigars. They are an absolute must if you hope to store your cigars. They come in a variety of sizes and styles and there are humidors to suit every style. If you are on a budget then it is possible to make your own and to even create temporary humidors. Although we have covered these topics in great detail it is important to learn and master these skills. To do so correctly almost guarantees you a positive cigar smoking experience.